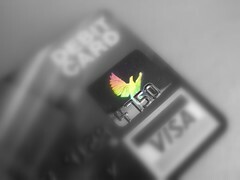 Tag Archive | "Debit card"
2. Do not share your debit card number and other information with anybody. There is never a good reason to give somebody else the information from your debit card. 3. Only use your debit card at reputable stores. One of the biggest mistakes you can make is using your card at stores that are unknown or do not appear to be legitimate. This holds true for both land based and online stores. 4. Speaking of online stores, make sure you proceed with caution. In todayâ€™s day and age it is simple for anybody to start their own store. At the same time, it is just as simple for somebody to steal your debit card information by doing so. Along with this, make sure all the information you transmit to an online store is kept 100 percent secure. 5. Memorize your PIN number. Did you know that some people keep their PIN number in their wallet? Worse yet, there are users that write their PIN on the back of their card. While this may sound silly, it is an all too common mistake. To avoid these types of issues, all you have to do is memorize your PIN. Donâ€™t worry about forgetting it. If need be, you can always reset your PIN number at a local branch or even over the phone. There is no reason to take a safety risk with your debit card. Instead, follow the five tips above. They will keep you, your finances, and your debit card safe. 2. A government debit card works just like any other debit card or credit card. For this reason, users are well aware of how to use the card from day one. Preloaded debit cards can be linked to any government payment or payroll check. If you are currently receiving your government benefits in the form of a check, consider what it would mean to your finances to change over to the debit card option. You may find that this is much more convenient. After all, you will never again have to go to the bank to cash your check. 3. For more information, you can visit socialsecurity.gov â€“ a debit card page is available with additional information. If you would rather speak with a live representative, you can contact Social Security by calling 1-800-772-1213. Remember, this is a relatively new program that the government is aggressively promoting. They are encouraging people to use a debit card, as opposed to paper check, because of the overall convenience and security. Are you excited about the prospects of having your government benefits put on a debit card? If so, you may be surprised at how quickly you can make the change. Once you get in touch with the proper party, such as the Social Security Department, you will be well on your way to receiving and using your debit card instead of paper checks. To learn more, follow the advice outlined above.